She theorized that children develop three coping strategies: the expansive (Aggressive) solution, the self-effacement or submission (Compliant) solution, and the resignation or detachment (Withdrawn) solution. Those falling into the Aggressive category exhibit needs for power, recognition, achievement, admiration and to exert their will over others. The Compliant category includes the needs to be liked by others, to be people-pleasing and for a partner to take care of them. The Withdrawn category includes the needs for self-sufficiency, to minimize one’s needs so as to be less dependent on others and to avoid attention. 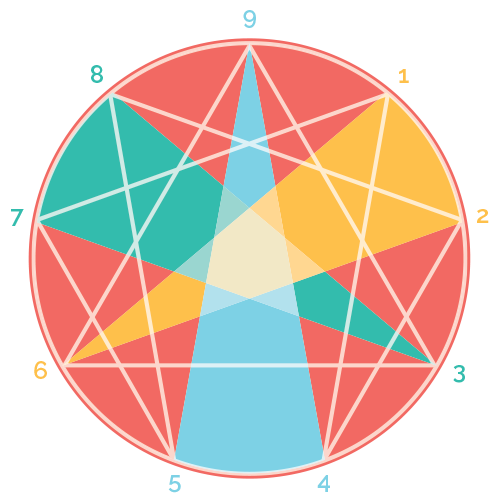 Riso and Hudson have further developed this typology and correlated it with the types on the Enneagram. There are some differences between their work and Horney’s original definitions, however it is more the symmetry of the Enneagram lending refinement and organization to the original ideas rather than the ideas having to be modified to fit the Enneagram. It’s worth noting that Karen Horney was likely a type Four which will necessarily affect the way she saw others. Being a member of the Heart Triad, she may have interpreted others’ motives through her own lens of concern for value, recognition and mirroring. This is an example of how the organizational characteristics inherent to the Enneagram can be leveraged to remove the biases that we’re all prone to.